I seem to go through phases of using loads of egg yolks. I can’t bring myself to toss the rest, so then end up with a little bowl of egg whites in the fridge that is just waiting for me to do something with them. I also took a trip up to the city a few weeks ago and went to Miette, treating myself to a Rose and Geranium macaron, made like the rest of their flavours using whole skin-on almonds, fresh blitzed, so that they retain little flecks of the almond skin. 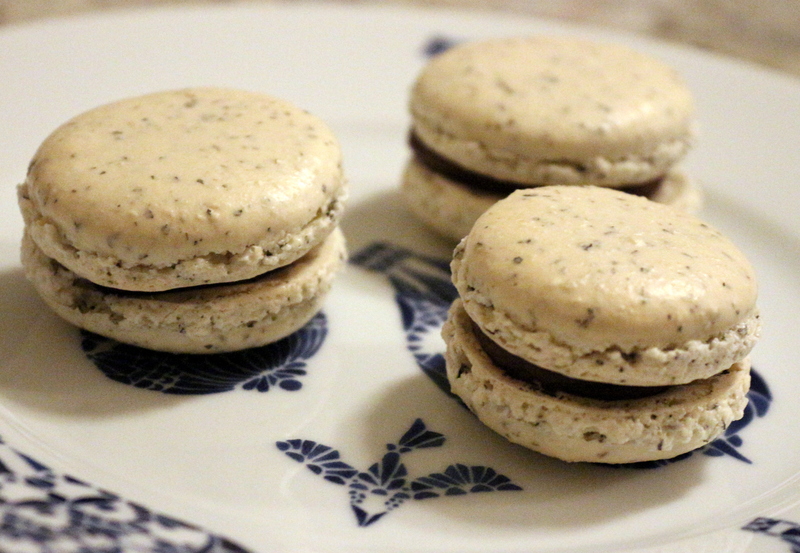 These two things, and it being free from week on GBBO (they are after all, gluten-free), inspired these little lovelies. I used almond meal from Bob’s, rather than whole almonds, but the flecks in them are down to peppermint leaves mixed in with the almond meal and icing sugar for flavour. Put the icing sugar, ground almonds, and peppermint into the bowl of a food processor and pulse until fully combined. Sift this mixture into a large bowl, discarding any small particles that stay in the sieve. 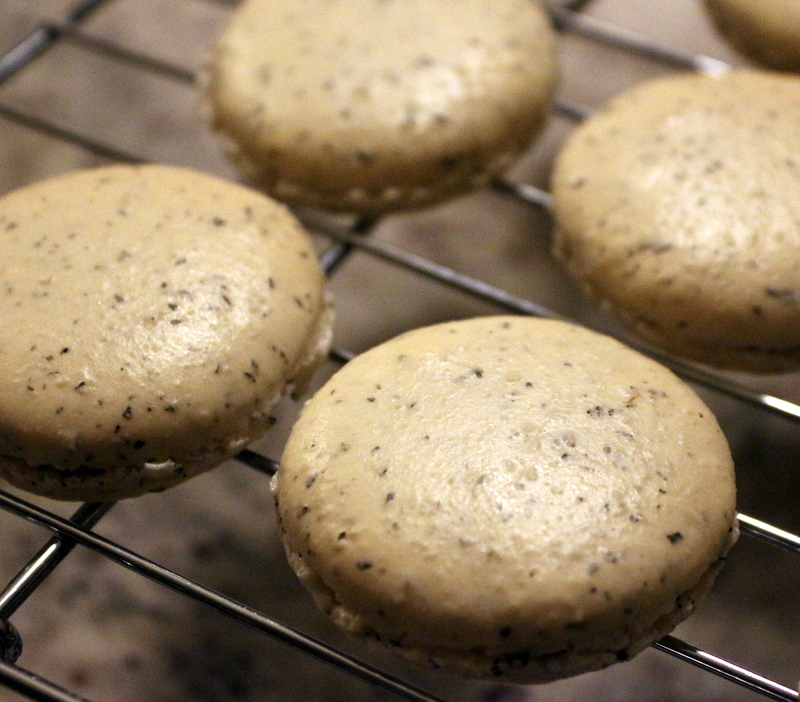 preheat the oven 170C/ 150C (fan)/340F/ gas mark 3, and leave the piped rounds to rest for about 30 minutes, or until the macarons have developed a skin and are no longer sticky. Bake for 12 minutes, then immediately slide the parchment onto the work surface and allow the macarons to cool for a few minutes before gently sliding them off the paper, and allowing to cool completely on a cooling rack. Put the chopped chocolate into a medium bowl and set aside. Put the double cream into a small pan set over medium heat, and bring just to the boil. Pour over the chocolate and leave to stand for a few minutes, and then gently stir until just smooth and combined. Allow it to stand until thickened enough to hold its shape. 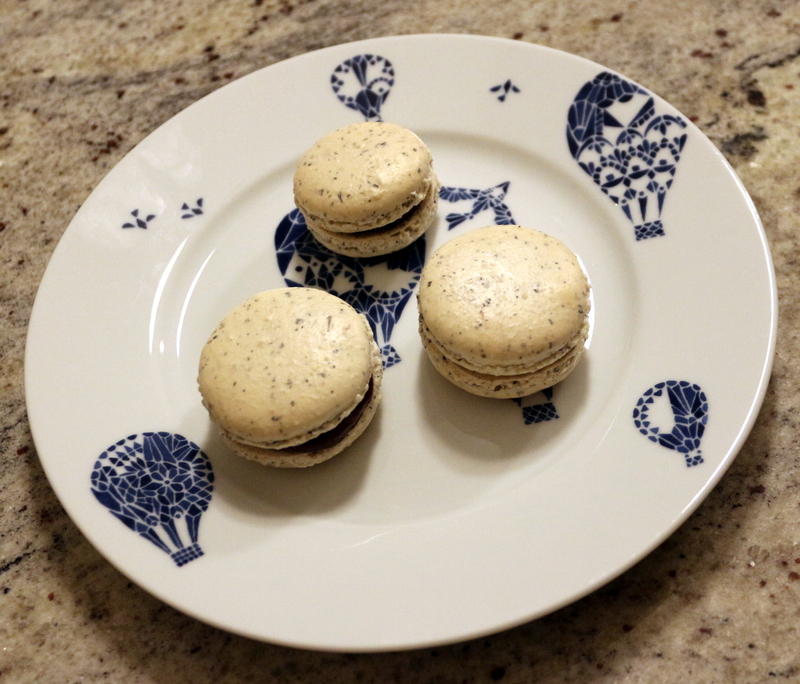 Fill a piping bag, fitted with a small piping nozzle, with the ganache and pipe onto half the macarons. It is a more subtle hint of peppermint flavour than you would get from using peppermint extract, and the taste of peppermint from leaves is different. If you prefer, you could add some peppermint extract to the mixture to enhance it, but I really like the effect of the bits of leaves in the finished macarons!